BMW Motorrad USA wishes to reward smart riders who took the time and invested in themselves to learn to ride motorcycles the proper way. That’s why riders who complete the MSF Basic RiderCourse? will receive $500 in BMW Rider’s Apparel with the purchase of a new BMW motorcycle. Apparel must be selected from the BMW Motorrad RIDE apparel catalog. Riders will also be reimbursed for the cost of their beginner rider course up to $350. BMW Motorrad is committed to safety, so we encourage all riders to gear up properly with our tried and tested BMW apparel. On the world’s finest motorcycles, rider and machine become one – which means the most important part of any BMW is you. That’s why we build our apparel with the same dedication to quality, comfort and performance as our bikes. So all you have to think about is the ride. Purchasers are eligible for one (1) MSF Basic Rider Course incentive during the program period (January 3, 2019 through December 31, 2019). 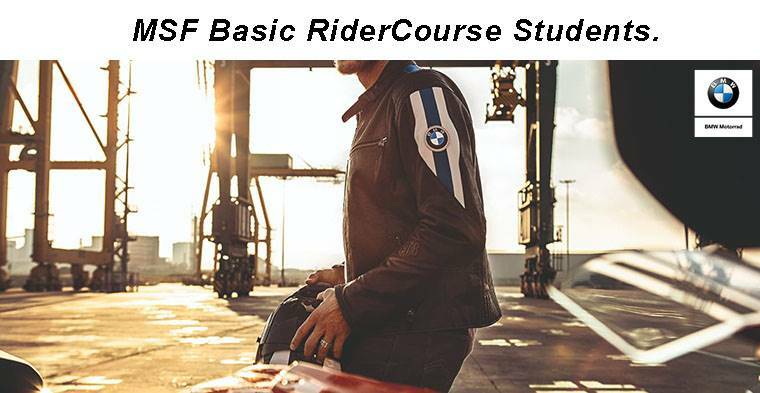 The MSF Basic Rider Course incentive must be original BMW Riders’ Apparel such as boots, gloves, jackets, etc. from the BMW MOTORRAD RIDE catalog. This incentive will not be paid for the sale of aftermarket products or accessories. Purchasers must have taken the MSF Basic RiderCoachSM or other accredited safety riding organization training and received their certificate within the previous 90 days prior to purchasing the motorcycle. Motorcycles purchased and reported under a name other than the eligible MSF Basic Rider Course applicant do not qualify. Sales documentation and claimant ID must match. This incentive may be combined with any other monthly retail customer incentive* available at the time of purchase for a qualified model (unless specifically excluded in the incentive program rules), which is defined as any new, previously unregistered BMW motorcycle sold between the dates of January 3, 2019 through December 31, 2019. BMW Motorrad fleet, auction or official P2 demonstrator units do not qualify. *May not be combined with other special purchase offers including BMW MOA / BMWRA / VBMWMO / BMW Car Club of America Offers, Military, Emergency Services, MSF RiderCoachSM or BMW Group / Center Employee or Valued Vendor Purchase Programs. Specific states offer Beginning Rider Course enrollment fee reimbursement upon course completion (passing with endorsement). Customers in these states are only be eligible for the Riding Gear portion of this incentive. This list includes but is not limited to; Illinois and Pennsylvania (this list is subject to change as legislation changes).